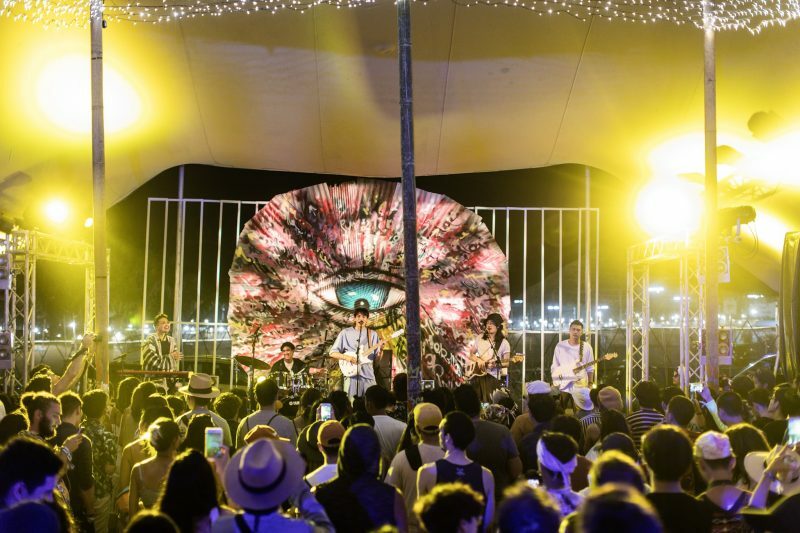 Wonderfruit is probably the closest that many in the region will get to experiencing a festival on the scale of Coachella or The Burning Man. As we walked into the grounds through the dirt path lined with colourful flags and banners, we were immediately immersed in a massive group of excited revellers. It felt like diving headfirst into a vibrant crowd that was a hybrid between a Brazilian carnival and individuals on their way to a fancy dress party; some of the more outlandish costumes included wing fixtures (these wouldn’t go amiss on the runways for Victoria’s Secret) and flashing LED lights (think of the movie “Tron”), while the tamer get-ups saw both men and women sporting faces adorned with bedazzled make-up and grooving along in kimono floral jackets. I’d initially tried to get out of attending Wonderfruit, going as far as assigning the trip to our resident music lover, Nawaf (he had to bail, due to another trip). The truth is, I’m very much a homebody; spending the weekend at a music festival in Pattaya – the crowds! the heat! the noise! – just wasn’t my cup of tea. All this changed when we got there; it was impossible not soak up the festive spirit. 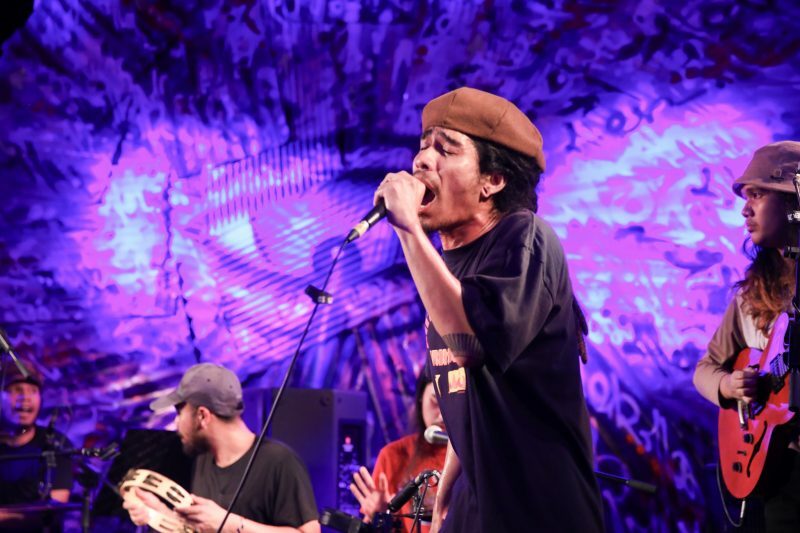 In addition to the different performances taking place on various stages, there were plenty of art installations and workshops going on. Feeling claustrophobic from the dense crowds? 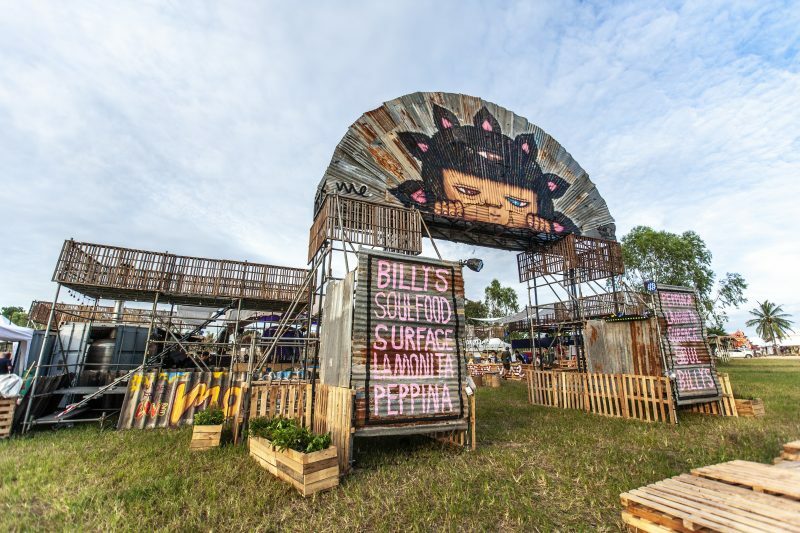 No problem – just walk out to any of the art installations or architecture pieces in the open fields for some time out. A personal favourite was the Bath House – a cool oasis of calm that offered some much needed respite (and escape) from the heat. One thing that stood out for me about Wonderfruit was how the festival had successfully drawn – and catered for – families with young children. At the Malom Bus exhibit, for example, I spotted parents with a toddler and a baby, checking out the light installations inside the revamped bus. The main highlight of Wonderfruit, without a doubt, was the long list of international acts. Most of them were indie artists that were quite hard to come by and we felt lucky that we got the opportunity to catch them live. Though music is so easily accessible these days, thanks to the Internet and streaming services, nothing beats catching a live act on stage before your eyes as you partied on with other fans. 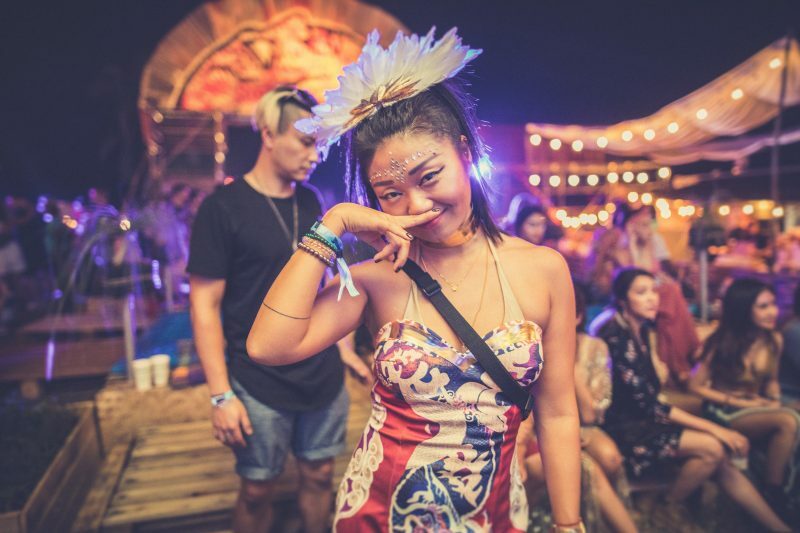 At its heart, Wonderfruit is a celebration of the arts – but what truly sets it apart from other festivals is its eco friendly mission and dedication to sustainability efforts. Case in point: in past renditions of the festival, 10,000 mangrove trees were planted at the Thor Heyerdahl Climate Park in Myanmar. As a first time Wonderer, what caught my attention was how single-use plastics were pretty much banned from the festival grounds (during the security check at the entrance, a friend’s bottle of mineral water had been confiscated). Instead, visitors were encouraged to utilise the official reusable Wonderfruit cup when purchasing drinks; as an added incentive, most vendors offered a 50 baht discount on drinks when you brought your own receptacles. Don’t be surprised to learn that all transactions at Wonderfruit are completely cashless. Before entering the festival grounds, we topped up our wristbands with some credit for any purchases (eg. food, drinks or souvenirs) we’d make later. We were advised not to remove the wristbands for the duration of the four-day festival as they’d serve as our entry tickets too. Scattered throughout the grounds were a number of ATM machines and top up stations where you could add extra credit to your wristbands too.